These meal prep bowl recipes are a great way to eat a healthier and more satisfying lunch or dinner everyday. I love that you cook something once and you have lunch or dinner for the week. You will save so much time and save so much money. No more running to the drive-thru for lunch! These meals have way more nutrients to keep you full longer than a hamburger and fries. I am pregnant right now and I seem to be hungry ALL DAY LONG. I love to have some of these meals waiting for me in the fridge so I can get a quick meal before I become hangry. My husband takes these to work for lunch and I eat them at home too, so something I like to do is on meal prep day make two different meals, that way we can switch it up so we aren’t eating the same thing every day. You could also double one of the recipes to make enough meals for two. 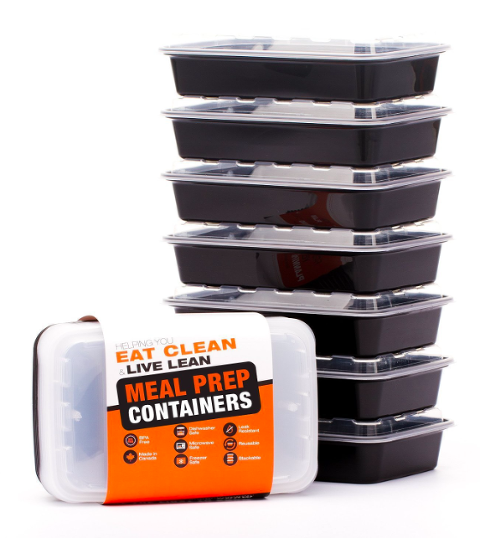 These are my favorite meal prep containers. They are big enough for the meal, the lids stay on tight, they’re affordable, reusable and BPA free. If you prefer glass containers, these are a great option. They are more expensive than plastic, but they’re reusable and you’ll get a ton of use out of them. I love the locking lids on these containers. Click on the links below each photo to find the recipe and directions for each delicious meal bowl. A lot of them even have videos you can watch with directions. Enjoy! Healthy and easy seasoned chicken, zucchini, broccoli, tomatoes and red onion cooked on a sheet pan for less mess! Served with brown rice. Meat, rice, beans and fajita veggies loaded into one bowl for heating and lettuce, guacamole and sour cream loaded in another. Heat up the one bowl and top with the cold ingredients. Healthy and perfectly seasoned chicken and veggies roasted on a sheet pan served with brown rice. Flavorful jerk spiced chicken, black beans, pineapple salsa and yellow rice. Chicken breast, broccoli and asparagus tossed in a sweet and savory honey sesame stir fry sauce. Hearty healthy sheet pan with chicken, broccoli and sweet potatoes. Sesame noodles topped with sautéed chicken, fresh slaw and then some peanut sauce for dipping. Delicious and healthy cubed chicken breast marinated in a chili-lime marinade and then baked. Served with quinoa and green beans. Yummy greek marinated chicken, cucumber salad, tzatziki, red onion and tomato served over brown rice. Everything you love about fajitas made on a sheet pan and served with rice. Sweet and tangy marinated chicken served with brown rice. Easy and flavorful meal prep bowl with seasoned barbecue chicken, bell pepper, fresh pineapple, red onion with zucchini noodles. Easy to make and just as flavorful as the take out favorite, but much healthier. Saucy veggies and chicken made in the crock pot. Easy to customize to your tastes. Flavorful turkey taco meat, corn, brown rice and a simple pico de gallo. 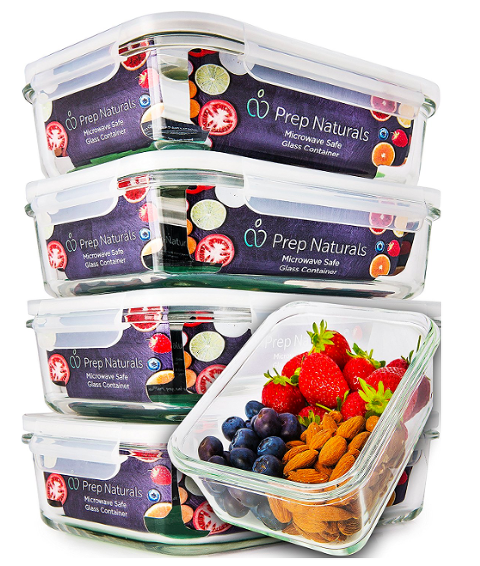 Glass meal prep bowls: these are microwave, freezer and dishwasher safe. This is a great option if you don’t like plastic.